This lacy beret studded with sequins, glass beads, or semi-precious stone chips was inspired by our men in uniform, but sports a decidedly feminine air. Knit in the round from the top down, it’s a quick-to-knit accessory. 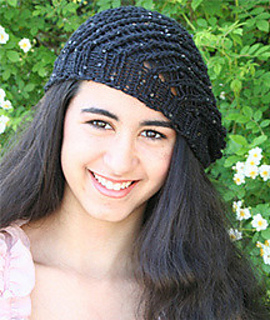 Written for circular needles using the Magic Loop technique (Magic Loop instructions included), the easy pattern features instructions for two sizes and three Tilli Tomas embellished yarns with generic yarn information included. Make it big for a loose soft look, or make it small for a jaunty fit!